HAMEL, ILLINOIS (December 6, 2018) – Gateway Bronco, innovative restorer of the first-generation Ford Bronco, announced today that it has finalized a license agreement with Ford Motor Company. Under the new agreement, Gateway Bronco will be licensed by Ford Motor Company to create 1966-77 Broncos according to the Low Volume Motor Vehicle Manufacturers Act of 2015. Gateway Bronco offers three models of the first-generation Bronco ranging from $120,000 to $180,000. All Gateway Broncos are backed by an industry-leading, bumper-to-bumper warranty through innovation and strict quality standards. The company protects each off-road vehicle from rust and deterioration using proprietary solutions, as well as modern chassis components and tuning know-how to make the ride smoother and more comfortable. 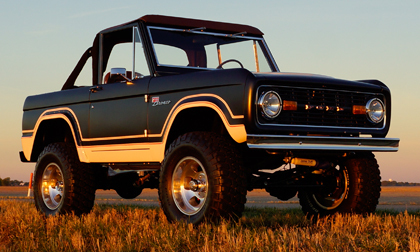 One of the largest restorers of the first-generation Bronco, Gateway is capable of producing between two and four vehicles a month and meets the Certified Reconditioned Vehicle standards established by Ford. Gateway Bronco, innovator in the re-imagination of Ford Broncos, guarantees up to a 5-year warranty by producing reconditioned off-road vehicles on a production line with quality checks each step of the way. Each product is equipped with a Ford Coyote 5.0L V8 engine, a 6-speed automatic transmission and is protected from rust and deterioration using proprietary solutions exclusive to Gateway Bronco. For more information, visit www.gatewaybronco.com and follow us on Facebook at Gateway Bronco.